These links and resources are presented only as a forum for those interested in the issues of presidential eligibility. It is not intended to be an endorsement of any particular site or position nor a representation of Terry's position. If you have other resources that you feel should be included please use our contact form to submit them. Bottom Line: Don't rail against the 'birthers' until you've reviewed the evidence. As Donald Trump says, "There is reason for doubt." Protect Our Liberty / Charles Kerchner:·Commander Kerchner has lead the way in many key areas. Many great links, graphics, etc. Cmd Kerchner's foundation has sponsored the two full page Washington Time ads. Jon Christian Ryter: A great site with essays on a wide range of social and politcal issues. The Complete Obama Timeline: A great research tool. 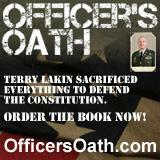 Devvy Kidd: Great article, "MILITARY BRASS EAT THEIR OWN FOR POLITICAL EXPEDIENCY"
Safeguard Our Constitution: The site that started Terry's case including the original vidoes and much background information. Birth Scorecard: Overview of all cases regarding Constitutional eligibility. Loyal to Liberty: Alan Keyes' blog full of insights and observations about everything. Birther Report: Regularly updated blog of a wide range of eligibility issues and articles. NoBarack08 Blog: Even the world knows Obama is ineligible. Peter Boyles on 530 KHOW Denver: Peter has been a regular commentator on this birth certificate issue with numerous hard hitting interview and comentaries. A frequent interviewer of Greg Lakin. The Birthers: Another site with many articles and links. AKDART: A broad collection of eligibility articles and resource from 100's of sources. Dr. Orly Taitz: Activist on the issue with many resources. The Radio Patriot: ANDREA SHEA KING Show: Active and vocal spokesperson for a wide range of conservative issues. The Post & Email: A leading online news source for this issues and many others. Sonoran News: Many conservative articles and wide coverage of Terry's case.